Alpha-cyanoacrylate ester is used as the key chemical, which retains its specific properties and performance through the use of additives. The quality of the adhesive is determined by the high degree of distillation. PASCO FIX® is the result of many years of research and professional manufacturing. This explains the almost unlimited number of possible gluing combinations. PASCO FIX® also meets the highest demands in terms of elasticity, resistance to cold and heat, and to chemicals. PASCO FIX® is absolutely water resistant. Its outstanding properties include simple processing that requires no component mixing, quick setting even on absorbent surfaces, and very high strength. PASCO FIX® can be used in industrial manufacturing (e.g. automotives, plastics, sporting goods, model building, photo and optics, dental technology), in various trades and workshops as well as at home to a great extent. With PASCO FIX®, you get high-strength bonding that is suitable for wood, steel, aluminium, porcelain, PMMA, rubber, PVC, ABS, Luran and essentially all other commercial plastics and much more. They can be glued to themselves and to each other. Not suitable for cloth, paper, polyolefins (Teflon, polyethylene and polypropylene). Please note: For gluing polyolefins (polyethylene and polypropylene) ask for our PASCO® PRIME. Environmental protection: PASCO FIX® is completely non-toxic (children's toys, dental technology) once it has set. Do not ingest. Do not inhale the vapours. Glues skin and eyelids together in seconds. Keep away from children. Use soapy water or a hand cleaner to clean any area of the skin with the adhesive on it. Treat eyes with a special eyewash. Contact an ophthalmologist. 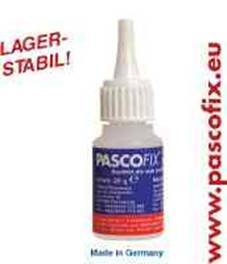 PASCO FIX® industrial adhesive is only available from authorised dealers, at trade fairs or directly from us. Feel free to contact us any time. We would be happy to advise you. Attention: New!!! It is possible to glue polyolefins (PE and PP) in combination with PASCO® PRIME. More information about this is available in our special technical datasheet. PASCO® AKTIVATOR causes the PASCO FIX® industrial adhesive to react quickly with these materials, which are often difficult to bond. As a result, the setting time can be reduced to a few seconds. Apply PASCO FIX® and then drizzle on PASCO® FILL. The PASCO® FILL granulate can be used with all materials such as porcelain, wood, steel, non-ferrous metals, plastics, ceramic, paper, cork, etc. The hardened surface can be processed mechanically and painted.